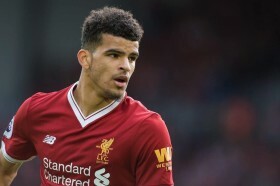 Liverpool yet to decide on Dominic Solanke's future? Liverpool are reportedly yet to make a decision whether Dominic Solanke should be loaned out when the transfer window reopens next month. The youngster has clearly fallen down the pecking order at Anfield this term and he has failed to earn a single minute of gametime in any competition. According to The Liverpool Echo, the Reds have yet to decide on a potential loan exit for the Englishman, who is attracting interest from the likes of Crystal Palace, Southampton and Rangers. The Merseyside outfit presently have Roberto Firmino, Divock Origi and Daniel Sturridge, who are ahead of Solanke for the striker's position but Jurgen Klopp is still keen on taking time to make the choice in case of any injuries. Liverpool have already been hampered in the defensive scheme of things with Joe Gomez and Joel Matip on the sidelines but they have still maintained their form which sees them top of the standings.